A great punch to serve at graduations, bridal showers, confirmations or any other special occassion. Night before: Fill one ice cube tray with pineapple juice, one ice tray with cranberry juice, and one ice tray with grape juice. Freeze the ice cube trays overnight. Refrigerate the remaining juice (including orange juice). In small saucepan, over medium heat, dissolve sugar in 1/2 cup of water. Stir constantly. Once sugar is dissolved, bring mixture to a boil and boil for 1 minute. Remove from heat and allow to cool. In punch bowl, add lemon juice. 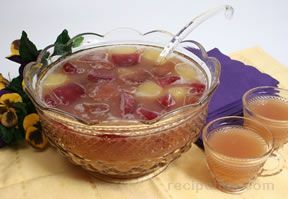 Pour the cooled sugar water mixture into the punch bowl along with the remaining juices (including the orange juice). Add sparkling water and stir. Prior to serving, add the frozen juice cubes.